Children will be signed into the Holiday Drop Off camp at the front reception desk and are offered a free choice session where children can socailise and meet new frirends. This free play session is a great way to slowly ease any nerves should there be any. After a team talk and safety briefing, children are given the opportunity to discuss, pick and choose what structured activity from the HDO sports list that they would like to take part in. A sample timetable can be seen above. Holiday Drop Off believes that the opportunity to 'create your own day' benefits both children who are sports enthusiasts, as well as those who are hoping to try something new. The HDO staff would will have carefully planned these activities on the day, offering a well-rounded mix of sports and activities for both boys and girls; we often offer up to 6 different sports per session! 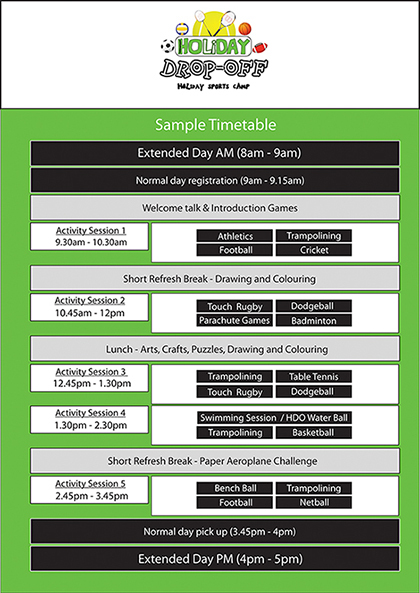 Each day has up to 5 sessions , offering an unbelievable range of different activities. Please note, that swimming is an option every day* and isn't a bookable extra. Each session is sandwiched between short breaks where children can unwind, refresh and refuel for the next round of exciting choices. *providing no swimming pool closures are in place. What do you need to pack for a HDO day? 2) Packed lunch with liquids. Holiday Drop Off works to specific staff to child ratios, for this reason, cancellations must be received 5 days prior to booking date via email to info@holidaydropoff.com for a full refund. Cancellations 24 hours before a booking is not refundable or transferable.